The Jews played an important role in the history of Pest, Buda, and Óbuda (Old Buda), and after the unification of the previous three, in Budapest’s development. Despite their persecution and the terror of the 20th century, we can still find many monuments of the once thriving Jewish Budapest. 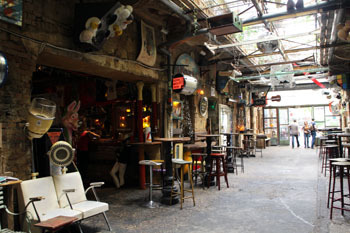 A Ruin Bar in District VII. Lokál Cafe & Bar), design centers, art galleries, bistros open in the area making it a hip place favoured by both locals and tourists. Take your time to absorb this sometimes quirky part of the Hungarian capital! These two Jewish heritage tours led by a professional guide in English show you the history and the most beautiful monuments of the historic Jewish district of the Pest side. 01 – 30. April: every day at 10.00 (except Saturday). 01 – 30. November: every day at 10.00 (except Saturday). Private tours: every day, except for Satirdays and Jewish religious holidays. After payment you’ll automatically receive an E-Ticket. Both tours cover the monuments and history of the Pest side. The Grand Tour is longer (3.5-4 hrs) and more detailed than the Basic tour (2 hrs). It also includes a cake with coffee in a kosher pastry shop (lunch in a kosher restaurant can be also reserved at 10 % discount price). Take the Basic Tour (2 hrs) if you don’t have much time but want to learn about Jewish culture and history in a nutshell, as well as see the most important monuments. The first Jewish settlers arrived on the Castle Hill of Buda from Western Europe in the 1050’s in the areas of today’s Víziváros (distr. I.) and Óbuda (distr. III.). By the 1200s Jews were in the most important economic positions in Buda. This was a sore in many people’s eye so the representatives of the Catholic Church had persuaded King András II. to include in the Aranybulla (Golden Bull -special decree issued in 1222) that Jews were not allowed to fill in such positions. Fortunately the fate of Buda’s Jewish community turned for the better during the reign of King Béla IV. He invited merchants from Germany to make up for the loss of population caused by the Mongol invasion (1241-42). They paid substantial tax to the king too. Buda’s Jewish quarter was on the western side of today’s Szt. György Square which were pulled down during the construction of the first Royal Palace. Part of the historic settlement had been restored but can’t be visited due to reasons unknown. Remains of the synagogue were excavated in 1964 part of which operates as a museum exhibiting Jewish relics and gravestones (opening hours: from 1st May till 31st October: Tue-Sun: 10.00-17.00, tickets: full price: 800 HUF, students, pensioners: 400 HUF.). The renovated labyrinthine cellar system that can be visited as of recently includes a small, 2-3 sqm ritual bath, the mikveh. 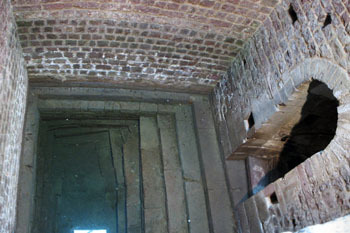 TIP: A historic Jewish ritual bath (mikveh) dated back to the 13. century has been unearthed recently at the Várkert Bazaar, a neo-Renaissance building complex at the foot of the Castle Hill. The English-language guided tours start at 11.00 from Thursday till Sunday. Tickets: 4 000 HUF/full price. The 11th-century ruins can only be visited on a tour organised by Bupap that organizes tours for locals (guiding is in Hungarian). 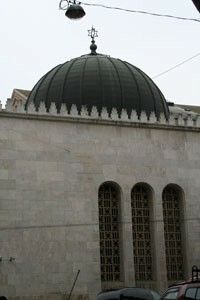 Note: They have a 2-hour English language tour of the Pest side titled “the Vacant Jewish District” Price: 2 000/1 500 HUF. The street level was 5 meters lower than today and the system includes a. 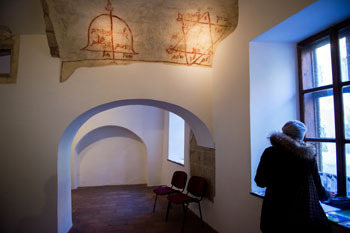 The Képes krónika mentions that there stood a synagogue and a mikveh at the Fehérvári gate in medieval times. The Small Synagogue and the Medieval Jewish Prayer house at 26. Táncsics utca remind us of the everyday life of the Castle District’s Jewish community. During the 150-year Turkish reign the Jewish community of Buda vanished almost entirely. In the 17th century German and Czech Jewish settlers established homes in Óbuda. Buda and Pest didn’t permit settlement of Jews until the end of the 18th century. Under the patronage of the noble Zichy family the Jewish colony of Óbuda developed into a prominent community. In the 19th century the Reform Movement fought for giving equal rights to Jews too. As a result of the movement’s efforts, Jews were free to settle down anywhere in Hungary including Pest and Buda. The Synagogue in Óbuda (Lajos utca 163., III. district) was built in 1820-21 in Classicist style. Today it houses a TV studio. Moses Muncz (1750-1831) was the rabbi of the community at that time whose grave you can see in the beautiful Jewish cemetery in Óbuda (Külső Bécsi út 369., III. district). 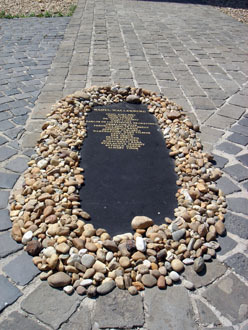 The memorial stone on the former Óbuda brick factory’s site marks the spot from where thousands of Jews were deported and sent to death under the terror of the Arrow Cross Party in 1944-45. 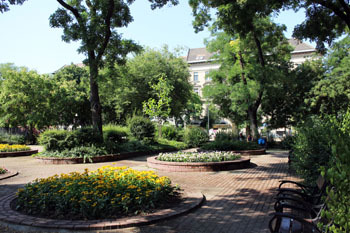 A nice garden surrounds the building of the secular Jewish Lauder Javne School (Budakeszi út 48. XII. district, bus No. 22. from Széll Kálmán tér) built in 1996. While you’re there, take a look at the building of the old Jewish kindergarden next to the school. The Old Jewish Quarter – District VII. In the 19th century Pest became the center of Jewish Budapest. Their religion, holidays and unique traditions made them form a community. Terézváros (the VI. and VII. districts in Budapest). 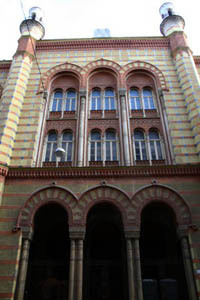 Three synagogues were built in the quarter: the most impressive of them is the Great Synagogue in Dohány Street built in 1859 in Moorish-Byzantine style. Address: Dohány utca 2., district VII. Note: The Ticket Office closes half an hour before the synagogue’s closing time. The synagogue is also closed on major Jewish holidays. children (ages 6-12): 800 HUF. TIP: If you have only limited time visit only the Great Synagogue and its surroundings. The two-towered temple can occupy 6000 people. 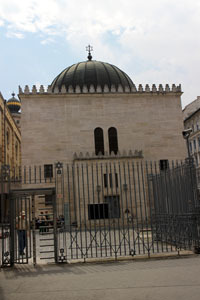 It is a neolog synagogue meaning that the men and women sit in separate areas within the church. The service is in Hebrew, and the 5000-pipe organ provides music. 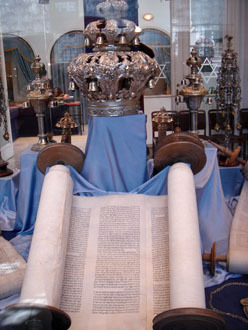 You can visit itonly with a ticket to the Synagogue/Museum. The Tree of Life monument is visible from the street through the fence. 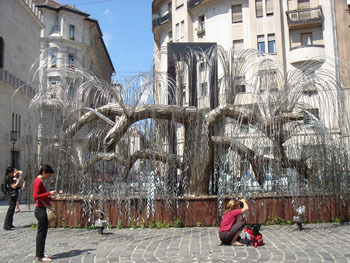 The silver metal weeping willow tree, the Tree of Life, stands in the Raoul Wallenberg Park. 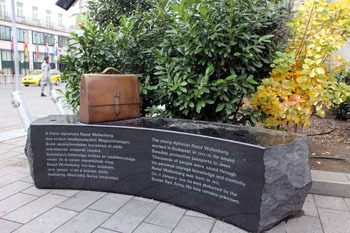 It received its name after the Swedish diplomat who helped many Jews to escaping deportation in 1944-45. 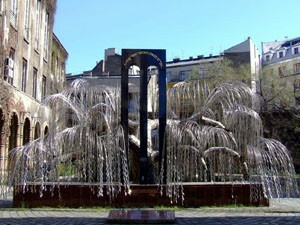 The Tree stands in the garden of the synagogue and the Jewish Museum. It’s a very moving and sad monument created by Imre Varga in 1991 with the support of the Emmanuel Foundation (founded by Tony Curtis actor). Names of the victims disappeared or died during the Nazi terror are engraved on almost each of the 30,000 leaves. Monuments commemorate the names of other heroes like Giorgio Perlasca and Per Anger. A small plaque on the Wesselényi street side of the synagogue marks the spot where once the gate of the Budapest ghetto stood in 1944-45. Not far from the plaque stands the small Garden of Remembrance where those who died in the ghetto were buried during 1944-45. Their names are engraved in the stone gravestones. According to Jewish customs cemeteries are not supposed to be placed next to synagogues, but this one in the garden of the synagogue, overlooking Wesselényi Street, was created out of necessity during WW II. Until the 2nd half of 1944 Budapest was reluctant to cooperate with the Nazis to collect and sent Hungarian Jews into concentration camps, though the Hungarian government (lead by Miklós Horthy) stood on the side of the Germans. Adolf Eichmann arrived in the Hungarian capital in December 1944 to carry out the deportation and execution of Hungarian Jews and Roma people. 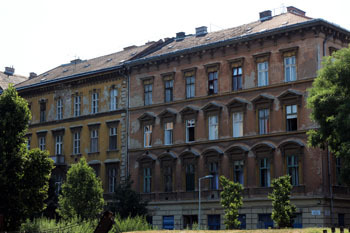 A ghetto was established between Király utca and Dohány utca. Because of the cold and the state of war the people in the ghetto weren’t able to carry their dead to the cemetery and bury them properly so thousands of corpses were left at the walls of the synagogue for 40 days. During the liberation of the ghetto on 18. January, 1945 thousands of unburied dead victims lay on the streets. 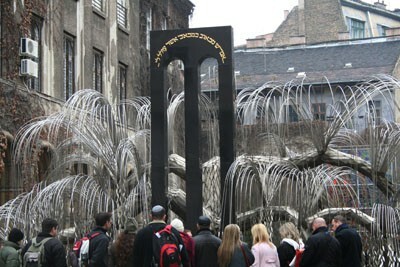 1140 known and 1170 unknown martyrs were buried in 24 common graves in the courtyard of the central synagogue. 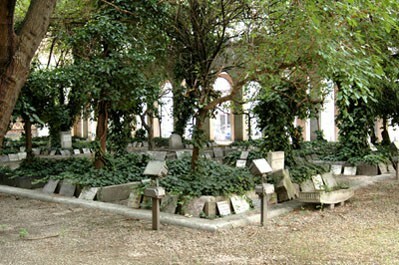 The Dohány Street Synagogue is the only synagogue in the world that has a cemetery in its garden. Jewish holidays 2017: when the museum & synagogue are CLOSED: May 31., June 01., September 20. 21., 22., 29., October 04., 11. (open till 14.00), October 05., 06., 12., 13.,023., November 01., December 24. 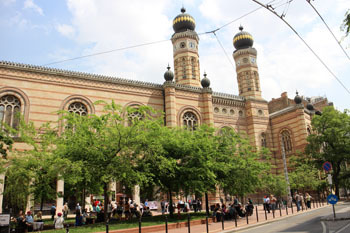 TIP: The Jewish Museum of Budapest on the left of the Great Synagogue has a collection of religious relics, historical documents, along with temporary exhibits. An arcade connects the museum with the modern-style Heroes’ Temple. It’s best to connect visiting the museum and the synagogue. 100 Years – 100 Objects – the exhibit celebrates the 100th anniversary of the opening of the Jewish Museum in 1916 in a small apartment in Hold utca. 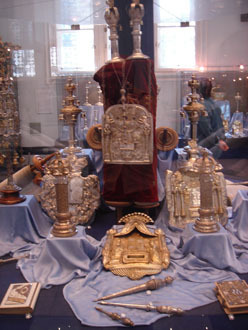 The collection then consisted of 1500 pieces: mainly religious, ceremonial objects, and historical relics. To this special exhibit 100 objects have been selected that tell the rich and layered story of Hungarian Jewry. Rosenthal lived here: in the Goldmark Hall (Wesselényi u. 7.) – History of Jewish Pest from the late 18. century to present days. The turbulent story of Pest’s Jewish community is displayed in 10 time periods through 10 digital maps. A thorough insight into the everyday life of the people who lived there. 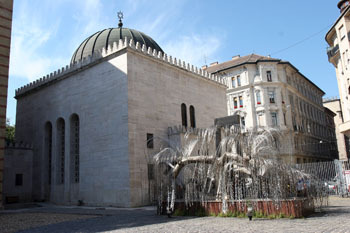 The temple connected with an arcade to the synagogue was built in 1931 according to the designs of László Vágó. It can seat 186 people and is used for weekday worship services. The Heroes’ Synagogue commemorates the 10 000 Hungarian Jewish soldier who gave their life for their country in the 1st World War. A huge Star of David formed of Hebrew text adorns the entrance. In winter the Friday evening and Saturday morning services are held here instead of the Great Synagogue. 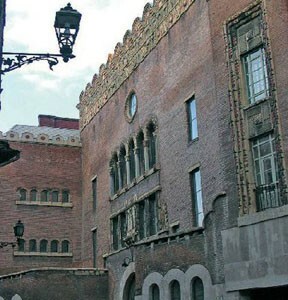 Address: Síp utca 12. – Wesselényi utca 7., district VII., entrance from Wesselényi Str. After the Raoul Wallenberg Park and the Heroes’ Cemetery you’ll find a 3-storey building which houses the Federation of Hungarian Jewish Communities (MAZSIHISZ) and is the centre of Budapest’s Jewish Community. The 12 reliefs on the facade symbolize the 12 tribes of Israel with their names in Hebrew. The building also gives home to the Goldmark Hall, a multifunctional cultural centre named after Károly Goldmark world-renowned composer. The Hungarian Jewish Archives has created a new permanent exhibition about Pest’s Jewish Quarter at the back of the room. On the 1st floor you’ll find the Gyökerek/Roots centre where databases and resources are available for those doing a family research. 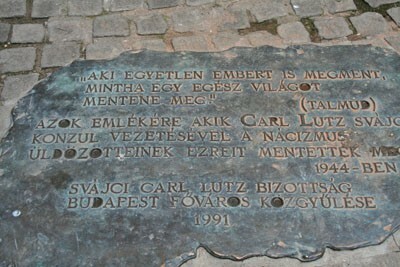 At 10., Dob utca on a small square you’ll find the Carl Lutz Memorial standing against a white wall on a tiny plaza. Lutz (1895-1975) as a Swiss diplomat had great connections with the Germans and Palestine thus he was able to help many Jews to flee from the terror. From Dob utca turn left on Rumbach utca where another striking Synagogue stands completed in 1872. Walk along Rumbach utca then turn right into Király utca, walk until you reach Kazinczy utca on your right. 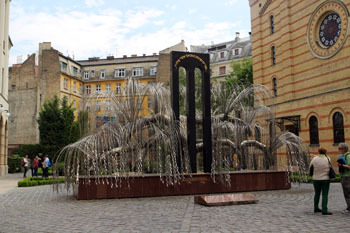 There stands the synagogue of Budapest’s Orthodox Jewish community. TIP: Kazinczy utca was renovated in 2012, it is now one of the city’s most popular nightlife spot with lots of great garden pubs, bistros, food bars. Read more on Kazinczy Street. Address: Kazinczy utca 29-31., district VII. The huge, Art-Nouveau synagogue is unmissable in the narrow Kazinczy Street. 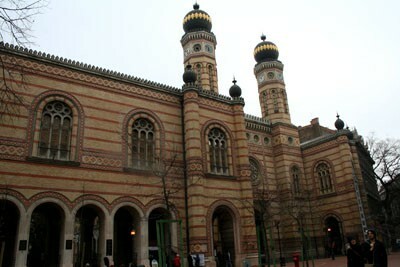 It functions as the house of worship and teaching centre of Budapest’s Jewish community’s orthodox branch. Béla Löffler and Sándor Löffler, disciples of Béla Lajta, designed the temple that was built between 1910-1913. From Kazincy Street turn right into Dob utca. 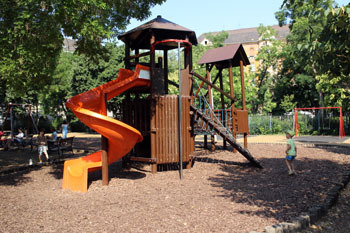 You’ll reach a large park with a playground, Klauzál tér. Locals relax and chat on the benches while looking after their kids. A rundown building typical of district VII. 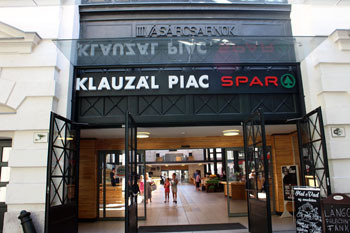 The Food Market on Klauzál Square was completely refurbished in 2015. It was one of the 5 covered market buildings constructed at the end of the 19. century, including the famous Great Market Hall on Fővám tér. Besides farmers selling vegetables and fruits, dairy shops, butchers there’s a large SPAR supermarket. On the ground floor you’ll also find a bakery & cafe and there’s lángos – the locals’ street food on the gallery. TIP: 10 firewalls of the district received a new look in 2013 and 2014: street artists painted colourful contemporary works on the grey walls giving the neighbourhood a vibrant, youthful vibe. see more Firewall painting photos in our facebook album. Monuments, Memorials in Downtown, District V.
The monument was erected in 2009 in memoriam of Gábor Sztehlo (1909-1974), an Evangelist pastor who on behalf of his bishop organised the hiding of 1600 Jewish children in 32 homes with support of the Red Cross. For this he received the Righteous Among the Nations title and the Yad Vashem medal in 1972. 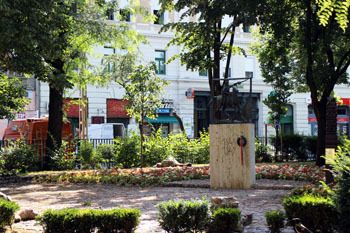 The monument titled “Do not Forget!” by Gustav Kraitz was inaugurated in June 2014 in the downtown Erzsébet tér park. The bronze briefcase abandoned on a bench with the monogram R. W. in its front, reminds us that though we do not know what had happened to the Swedish diplomat after the Red Army had captured him. His heroic deeds are not forgotten. 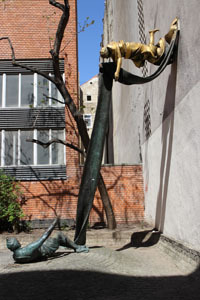 The Embassy of Sweden in Budapest initiated the creation of the uncommon monument as a gift to the Hungarian state. If you walk on the riverbank in Pest from the Parliament towards the Chain Bridge you’ll see pairs of shoes – men’s, women’s children’s – scattered on the pavement as if their owners have just jumped into the Danube. 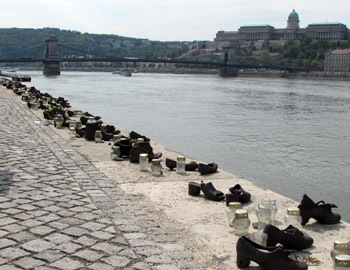 The 60 pairs of cast iron shoes commemorate the Jews shot into the Danube by the Arrow Cross Party in the winter of 1944-1945. According to current data, around 3 600 Jewish people living in Budapest were killed here during the cc. 3-month terror of the Hungarian Nazis. 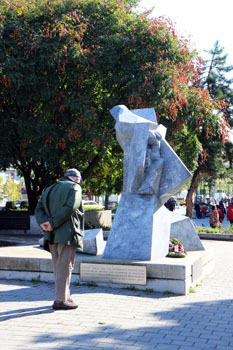 The memorial – that was set up in 2005 -was initiated by Can Togay film director and he created it together with Gyula Pauer sculptor. If you’re tired of walking have a rest and a few bites in one of the numerous eateries (both kosher and non-kosher) situated in the area. Address: Dob utca 22., district VII. Although the building looks a bit run down these days, the flódni is fabulous. It’s a traditional cake with layers of walnut, poppy seed and apple filling. 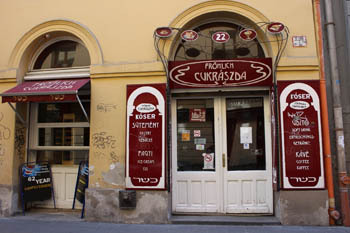 An unpretentious cafe ideal for a cake and coffee break when exploring Jewish Budapest. 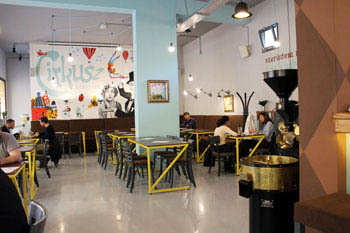 A new place right across Fröhlich with bright colours, spacious interior and their very own coffee roaster. Cirkusz is definitely will be one of my favorite places since they make coffee from freshly roasted beans. Food is not bad either not to mention the homemade pies and cakes. 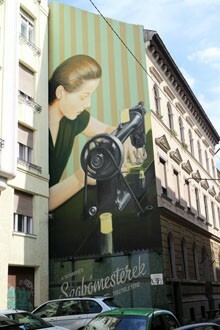 Address: Dohány utca 1., district VII. 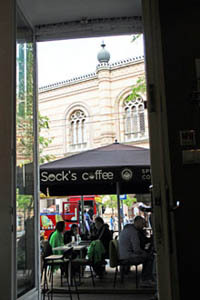 Socks Coffee opposite the Synagogue offers specialty coffee drinks prepared from the freshly roasted beans of a Hungarian micro roaster, Lucky Cap. other healthy treats are also available. A great place for a coffee break before or after visiting the synagogue! 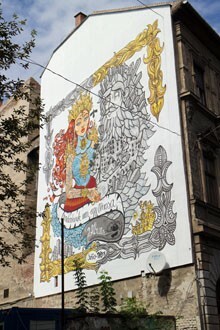 Address: Dohány utca 5., district VII. An exclusive Italian restaurant with top quality food. Always reserve a table. Address: Dob utca 50., district VII. One of the top Indian eateries in Budapest, Shalimar received mixed reviews on restaurant review sites. Some say the curry is very good, others claim that there are much better places offering Indian food in the city. Read more about Shalimar on our Indian Restaurants page. 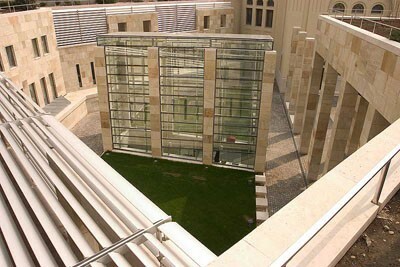 Next to the synagogue in Páva Street opened the Holocaust Memorial Center (Holokauszt Emlékközpont) in 2004. Free to children (the exhibits are recommended for children above 12), student’s groups (Advanced registration required), teachers, museologists, and senior citizens (70 and older). full price ticket: 1 400 HUF (50% discount with Budapest Card). Tickets are valid for the permanent and temporary exhibitions and for visiting the Páva utca Synagogue on the same day. Guided tours available by appointment in Hungarian, English, German, French, and Hebrew. massacre of Hungarian Jews and Romas committed in the name of Nazi ideology. TIP: Not far from the former Jewish district stands the magnificent New York Palace (today a luxury hotel owned by the Italian Boscolo group) housing the legendary New York Cafe. Just walk along Dob utca and you’ll end up at the imposing building at Erzsébet körút, a section of the Grand Boulevard (Nagykörút). See also our guide to Budapest Attractions, which includes lots of photos about our favorite sights in the city. Jewish Summer Festival – a diverse festival with exhibitions, concerts, theater and dance performances, book, and craft fairs organized usually at the beginning of September.